Do you or your kids love Harry Potter and Hermione Granger? 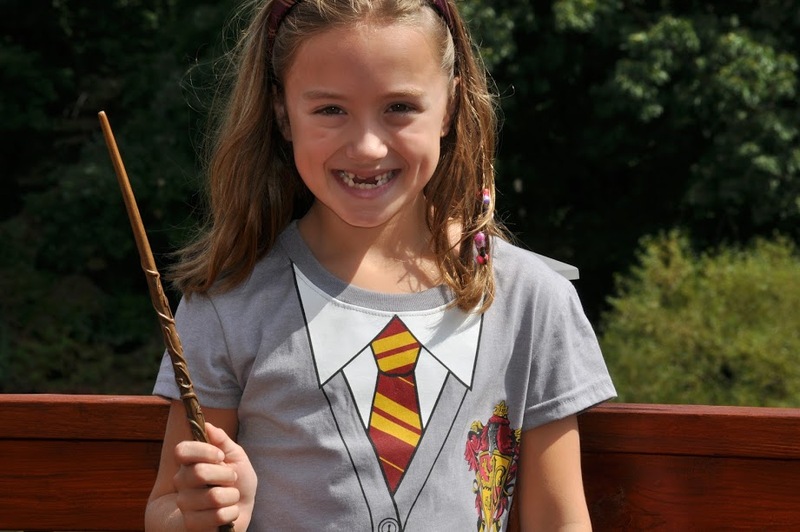 Here’s some inspiration to help you create a fabulous Hermione Granger or Harry Potter costume. 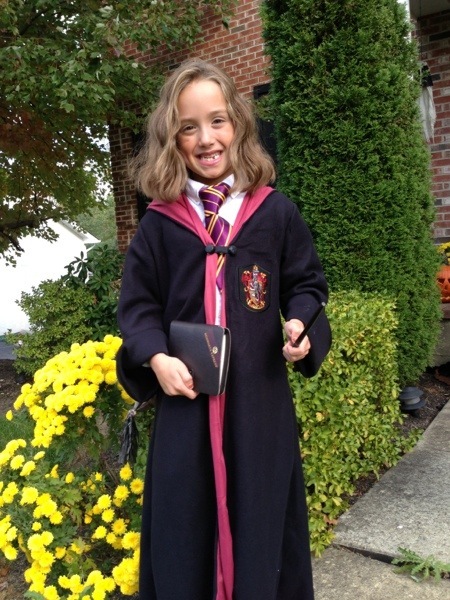 We’ve got inexpensive and super cute Hermione Granger Costume Ideas below that my daughter Kenzie used last year and will be using again this year. 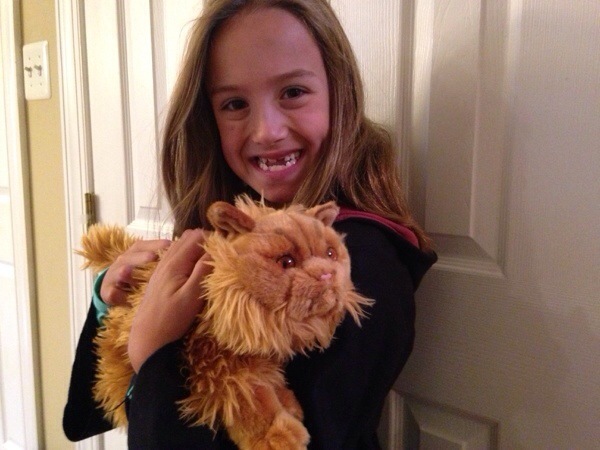 We’re adding Crookshanks the cat and a Gryffindor Headband too that we picked up at Universal Orlando when we visited Wizarding World of Harry Potter but is also available for sale online too! Here’s a collage of our ideas but you can see where to buy and close ups of everything below. These robes are fantastic and I picked one up for Kenzie last year and this year Kyle is wearing one as well for his Harry Potter costume. Check out HalloweenCostumes.com for robes priced at $34.99 – they are made of fleece and keep the kids warm while Trick or Treating too! 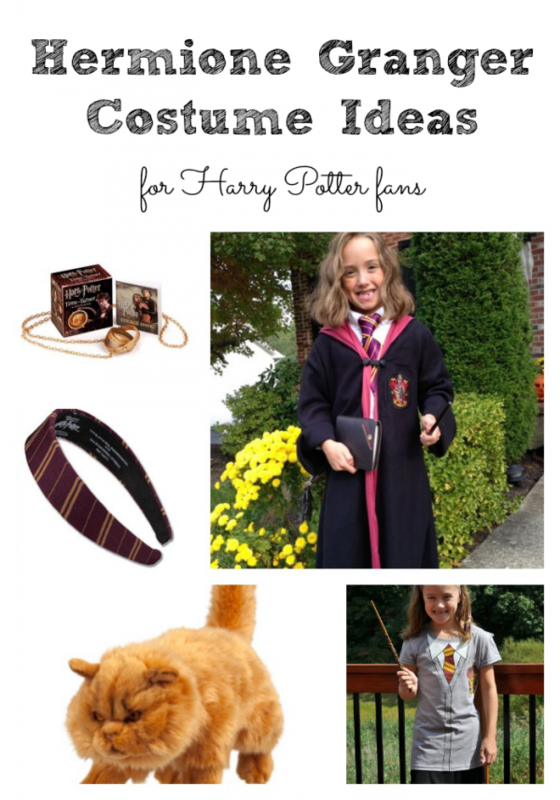 They come complete with a hood as well and work for any Gryffindor character – Harry Potter, Hermione and so on that your child would like to dress up as. 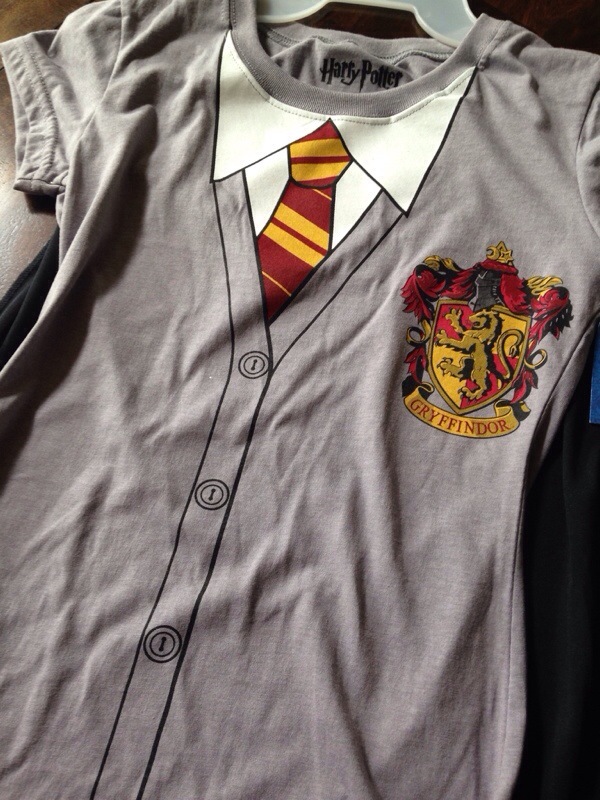 If you have a Harry Potter fan in your house like we do, than take note of this line of Harry Potter clothing sold in Walmart’s Junior department. Sweatshirts and tees pair perfectly with any other Harry Potter accessories you might already own. Kenzie picked up this Hermione tee-shirt that comes complete with a velcro cape for only $10.88. She is in love with it. It’s also really fun as a regular day outfit without the cape so we are already definitely getting our $10 out of this buy! Kenzie wears it every week now! 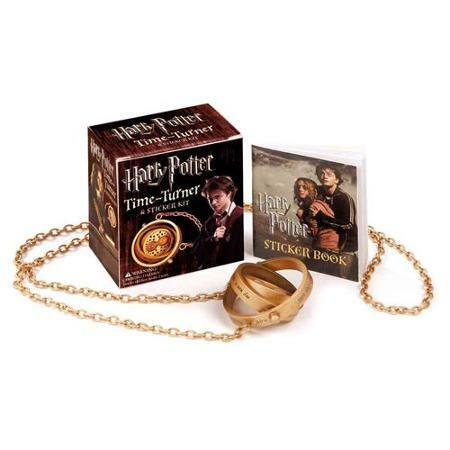 Walmart also sells these fabulous Hermione Granger Time Turner necklaces that are complete with sand in an hour glass within the charm. 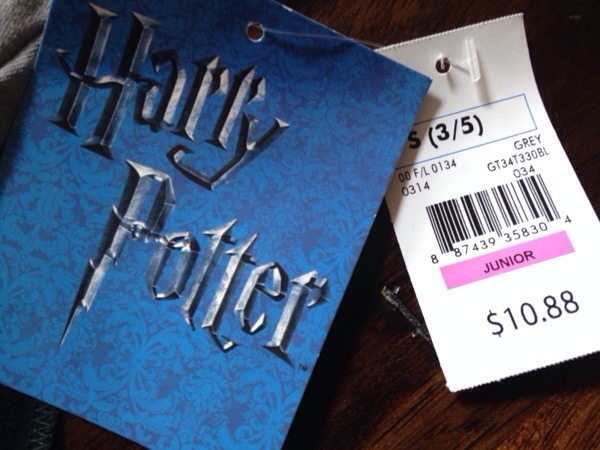 I bought this for Kenzie this year for her birthday so she’ll be using it this year to spiff up her Hermione costume. Priced at only $8.95 this is a steal and we’ve been impressed with the quality of it given the price. It looks so cool Kenzie has been wearing to school all week as part of her regular outfits. Yes…. she loves Harry Potter so much that she is going to be Hermione Granger for the 2nd year in a row. Love it! And I love that we’ve got some new additions to her costume too! 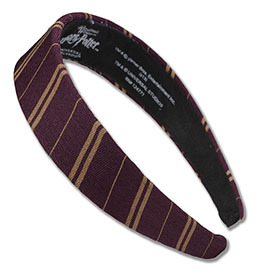 We snapped this Gryffindor Headband up as well at the official Universal store for only $16. Also available online too! she decided to plan a wig party.